Do you have a great idea for a project that makes your community stronger, healthier, or more vibrant? Need some support to bring your idea to life? ioby is a nonprofit crowdfunding platform built to support local leaders like you. Our powerful platform and one-on-one support helps leaders across the US bring their great ideas to life, one block at a time. Check out answers to some commonly asked questions about funraising with ioby below. We're a nonprofit crowdfunding platform for people who want to get good done in their community. ioby stands for “in our backyards,” but it also stands for taking care of each other, for civic participation, and for trusting neighbors to know what’s best for the neighborhood. Our tailored coaching and crowdfunding platform gives local leaders–like you!–the ability to raise the resources they need to build real, lasting change from the ground up. 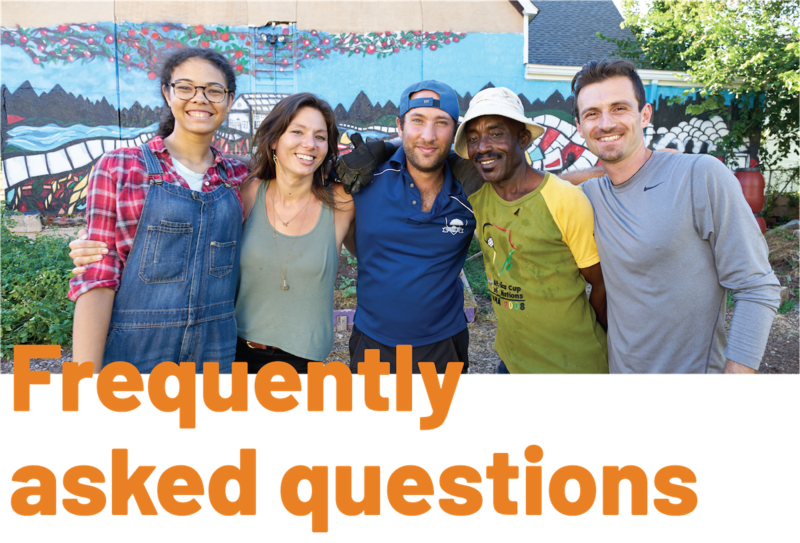 Our tailored, one-on-one services help connect leaders with the support and funding they need from their own communities to make our neighborhoods even more awesome than they already are. Learn more about the principles that drive us here. We provide an affordable online crowdfunding platform (with some of the lowest fees in the biz), paired with one-on-one fundraising coaching from a Leader Success Strategist. From creating a fundraising plan, to helping you get unstuck when you get stuck, we're there with you every step of the way. We also regularly provide workshops, webinar trainings, and resources to help you nail your crowdfunding campaign and bring your great idea to life. For the most part, any US based project with a clear public benefit is eligible to crowdfund with ioby. Food justice? You got it. Local park improvements? Check. Community organizing? Oh yeah. Renewable energy? Yup. Bike Infrastructure? Another yes! Public art? We love it! As long as your project benefits your community as a whole, and is not for private benefit, the sky's the limit. Learn more about criteria for projects that crowdfund on ioby. We cannot currently support for-profit business startups, campaigns that benefit just one individual (such as campaigns for medical costs), or international campaigns that benefit non-US residents. Anyone in the United States and its territories can fundraise on ioby. We support leaders everywhere from small towns to big cities. 2,000 leaders from nearly 300 towns and cities across the United States have raised over $6 million on ioby to get good done. Learn more about our impact in our annual Giving Report. Simply share an idea anytime at ioby.org/idea. Once you've submitted your project idea, you'll immediately have access to our training materials to start building your ioby campaign page. Within 24 business hours, you'll also hear from your dedicated Leader Success Strategist, who will set up a call with you to answer any questions you have and set you on the path to fundraising success. Your Success Strategist will work with you throughout your campaign, so you'll know just who to call when you need help. I heard you have match funding. How does that work? ioby works with partners nationwide to develop innovative match funding programs to support community projects. With our partners' support, we occasionally offer specific match funding opportunities that can double the impact of your fundraising work. Match programs are generally limited to specific types of projects, rules set by our partners (parks projects in Memphis, for example), and we often open new ones through out the year. Check out our currently open matches, or sign up for our newsletter to be the first to know when a new match launches. Crowdfunding is a way to fundraise for a project by pooling lots of people's resources to raise the amount you need. Powerful crowdfunding platforms, like ioby's, help you communicate your projects goals, allow your donors to give securely online, and ease the process of sharing your project on social media, over email, and in person. With crowdfunding, you don't need huge donations to get to your goal–you just need a strong community that's willing to support your idea. Even with small donations add up to big impact. Who will donate to my crowdfunding campaign? Successful crowdfunding campaigns are funded by neighbors, friends, family, local businesses, and others who would love to see your project brought to life. We often like to say that you probably already know most of your donors! How long is a typical crowdfunding campaign? Campaign length varies depending on how much you need to raise, how big your team of fundraisers is, and how quickly you're able to fundraise. That said, the average ioby campaign runs for about 5-7 weeks. Don't meet your goal in your timeframe? ioby has a flexible finish policy to help you raise the funds you need. How does ioby's fundraising coaching work? Before your campaign goes live, you’ll have access to ioby’s Leader Toolkit, an easy getting-started guide, as well as other fundraising resources that are specific to your campaign’s needs. You’ll also be paired with one of our Leader Success Strategists, an experienced fundraising coach who can help you plan your budget, create a campaign schedule, and hone your fundraising asks. You can work with your Success Strategist over phone or over email, and they will be available to answer your questions and provide guidance throughout your campaign. Or if you're feeling confident in your fundraising chops and don't need much help, let us know! We'll only provide support when you want it. Will ioby fundraise for me? No crowdfunding platform fundraises for your project, but ioby provides the tools and coaching you need to run an effective crowdfunding campaign. We'll help you create a fundraising plan, come up with likely donors in your network, strategize how to make asks, and come up with a plan to reach your goal. While it's tempting to look at viral crowdfunding campaigns for inspiration, the fact is that 90% of donations to online crowdfunding campaigns are made by people in the extended network of the fundraising team. No matter what platform you use, crowdfunding always starts with your crowd. What will make my crowdfunding campaign successful? In the ten years that we've supported leaders crowdfund, we've found that the top predictor of a successful ioby campaign is the size of your fundraising team. Having a committed team of at least three or four people--or more, if your goal is large--can be the difference between a successful campaign and a fundraising flop. While no two crowdfunding campaigns are the same, we’ve collected several best practices from the 2,000+ projects that have been funded on ioby's platform. When you work with ioby you'll be assigned a Leader Success Strategist, a grassroots fundraising expert who can help you craft a stellar campaign page, set the right campaign target, help you build a winning team, plan campaign communications, and more. What’s the fee for using ioby? Our fee is one of the absolute lowest among crowdfunding platforms, and there is no up-front cost for using ioby. At the end of your campaign, we retain a flat fee of $35 that helps us keep our platform running (and we waive that fee if you raise less than $1,000). We also retain a 3% processing fee that pays our secure credit card processor. Lastly, there's an optional 5% fee that is only retained if you opt for ioby's fiscal sponsorship service. Your Leader Success Strategist will help you calculate your estimated fees when you begin your campaign, and factor it into your fundraising goal, so there are no surprises. Read more here. As a nonprofit, ioby receives foundation grants that help fund our core operations. We also rely on the support of the community of leaders and donors that we work with. Every time a donor supports a project on ioby, they are given the option of adding gratuity–a small donation to ioby–to their total. Gratuity is made transparent to donors during check out and is completely voluntary, but is essential to keeping our fees low and coaching services strong. ioby does not solicit donors to ioby campaigns again after checkout. You can always keep what you raise on ioby, even if it’s less or more than your original fundraising goal. Our flexible finish policy allows you to edit your campaign deadline and fundraising goal if needed, so you can adjust if things change during your campaign. Read more here. Are donations to ioby campaigns tax deductible? Yes, every donation to every ioby campaign is fully tax-deductible. When your donors give, they receive an automated thank you from ioby that provides them documentation of their tax-deductible donation. What if I’m not a nonprofit? On ioby anyone with a great idea that improves their community–even individuals and informal groups–can easily raise tax-deductible donations. If you are not a nonprofit, and not already working with a nonprofit fiscal sponsor that can accept funds on your behalf, ioby can serve as your fiscal sponsor for funds you raise, so all donations to your campaign remain tax-deductible. There is a small fee for ioby's fiscal sponsorship that covers the cost of managing funds. Learn more about fiscal sponsorship here. How does ioby’s fiscal sponsorship work? At the end of your campaign, we’ll sign a simple fiscal sponsorship contract with you, in which you’ll commit to using the funds you raised toward the charitable purpose described in your fundraising campaign. You'll also need to submit receipts to ioby for the purchases you make with the funds you raise. ioby charges a 5% administrative fee for fiscal sponsorship. Learn more about ioby's fiscal sponsorship here. Search for answers to other questions at our support center, or drop us a line at hello@ioby.org. We're more than happy to chat with you about your project idea, or provide more information about crowdfunding with ioby. So, what's your big idea to improve your community?